JOINING HANDS TO SUPPORT OUR CHILDREN'S FUTURE. 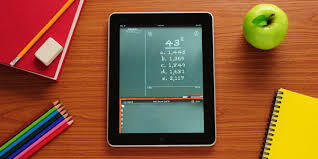 Read "Earn Easy Money for BES." 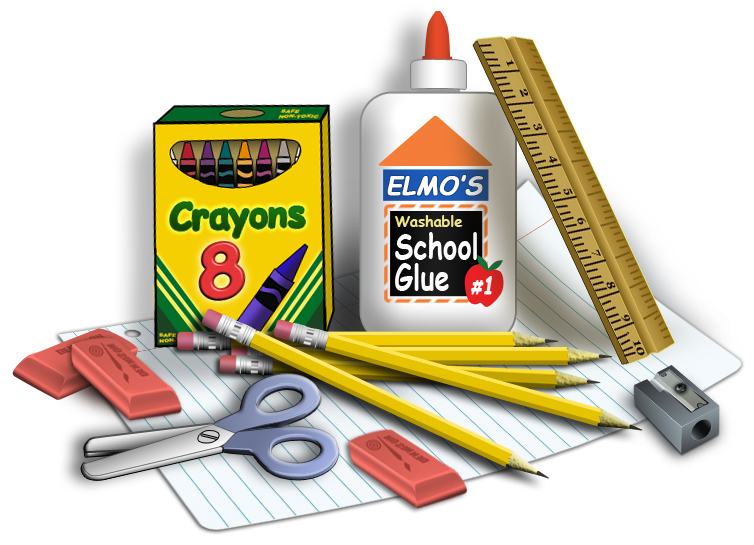 You will be amazed at the simple and FREE ways you can contribute to Banks Elementary and your child's education. Join us this Wednesday evening in the BES library classroom! 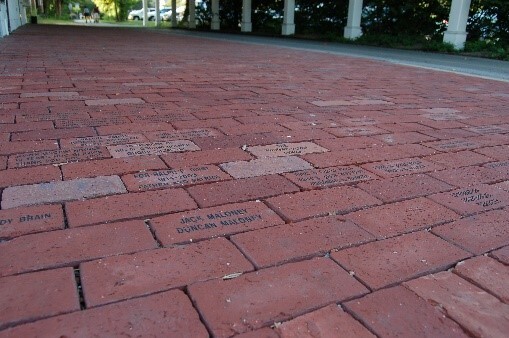 For just $75.00 you can purchase a brick and leave your imprint on the Banks Elementary campus. v Anyone involved with the Banks Schools in any way is invited to participate. This includes grandparents! 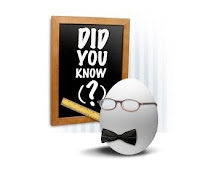 v Businesses can buy a brick and have their company name engraved on it. 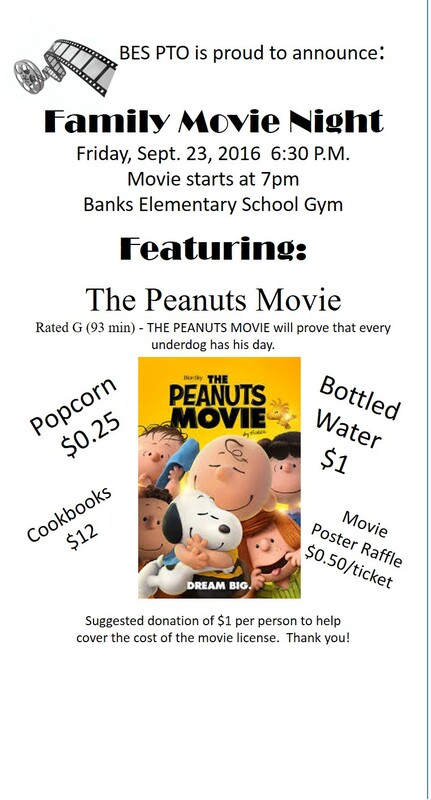 v The profits from this fundraiser will benefit the Banks Elementary PTO organization. Brick engraving is limited to 2 lines and 15 characters per line, including spaces. You can put your children’s names and graduating year, or your family name, business name, etc. 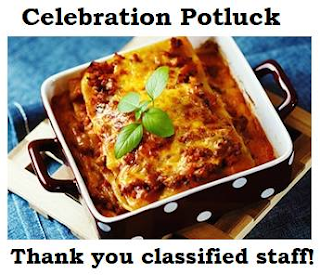 March 4-8 is Classified Staff Appreciation Week. Please join the PTO in celebrating BES classified staff and all they do for BES. 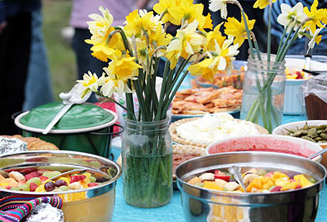 Food plays an important role in how we all celebrate so we are asking you to pull out your favorite recipes for celebrations and share it with our staff. Please sign up at the link below to bring your favorite celebration dishes to the front office on Wednesday, March 6th, by 10:30am. Thanks! Let’s share some holiday cheer with the BES staff with a Cookies & Dessert potluck! 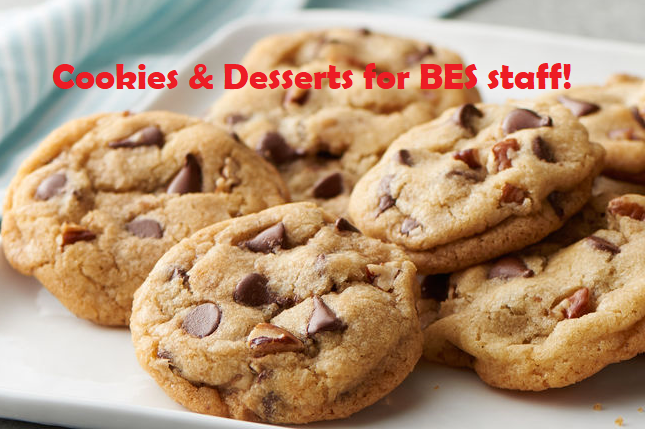 Please sign up at the link below to bring your favorite holiday cookie or winter dessert to help show BES staff how much we appreciate all that they do for our kids. Drop off your items in the office the morning of Thursday, December 20th. Thanks! Join us in the BES library classroom. We hope to see you there! Parent Teacher Conferences are next week and the PTO is hosting a potluck to show our appreciation for the time our teachers put into conferences. If you would like to provide a favorite family dish or dessert to the potluck please click this link to the signup genius. 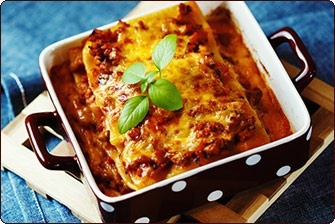 The dish will need to delivered to the main office on Wednesday the 17th by 3:45 pm. If you have any questions please don’t hesitate to ask via email at bankselementarypto@gmail.com. Thank you! The PTO meets Wednesday, August 29th at 6pm in the BES library classroom. This will be the first meeting of the 2018-2019 school year and we will be approving the budget and the PTO calendar for the year. On our calendar is a movie night, a catalog sale, a family dance, and a carnival/auction. We are looking for volunteers to chair events either individually or with a partner. Ideally the carnival will be co-chaired. If you are unable to attend the meeting, minutes are posted within a day or two. Take a look at what is planned. With good communication the PTO can use the help of volunteers whose schedules don’t allow them to attend meetings. The PTO has made a commitment to be as flexible and supportive to volunteers as possible. If you are hesitating to volunteer for any reason please discuss your concerns with a board member. We look forward to a successful 2018-2019 school year. We appreciate our volunteers. Join us for refreshments and a small token of our appreciation! Show appreciation to our amazing Banks Elementary Staff by bringing snacks or treats on Friday, May 11th, for Staff Appreciation Week! 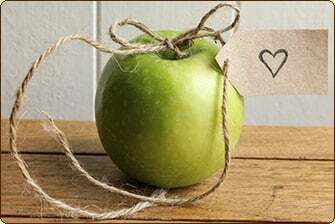 Click here to sign up to bring something sweet, savory, healthy or surprising for staff to enjoy throughout the day! Also, this week, if you have extra Easter candy that you'd like to get out of your house, the staff room junk food drawer could use a refill. Feel free to drop it by the front office this week. Next week is Conference week at BES and the staff will be working extra long hours. Help us provide them with a hot meal to say Thank You for their hard work! Contributions will can be brought to the office by 3:30PM on Thursday, Nov 2. 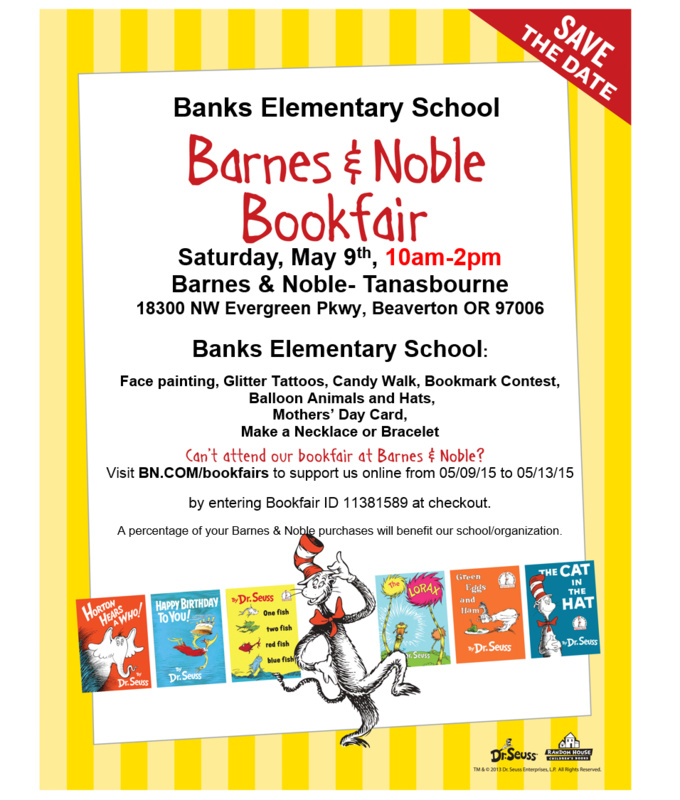 If you have any questions email Melissa at bankselementaryPTO@gmail.com. 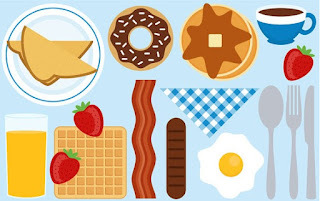 The PTO is hosting a potluck breakfast bar for the entire BES staff of 50 on Oct 12th. Bring your favorite breakfast item to show our staff how much we appreciate their hard work! Items need to be delivered to the school office no later than 8am Thursday, Oct 12th. This is a NO SCHOOL grading day. As many families will have plans for this 4 day weekend, drop off/pick up of contributions can be arranged for Wed, Oct 11th at the link below. Thank you for supporting the BES staff and the BES PTO! Order forms will be in your child’s Friday folder or you can print a copy from the link below. Please submit payment along with the order form and return to your child’s teacher or the front office. Orders must be received by October 4. Thank you to everyone who attended the PTO meeting this morning. It was a positive meeting and much was accomplished. Thank you to Mr. Leo for attending and sharing his insights with us. If you were unable to attend the meeting keep an eye on the blog where we post meeting minutes. Have a great day! Click on the link below to submit your entries for the new 2017-2018 directory. Please make sure you submit a separate form for each child. NEW THIS YEAR! Click on the link below to submit your Volunteer Preferences. All Volunteers need to fill out an annual background check form at the school office. Come and join us for our first meeting of the school year. 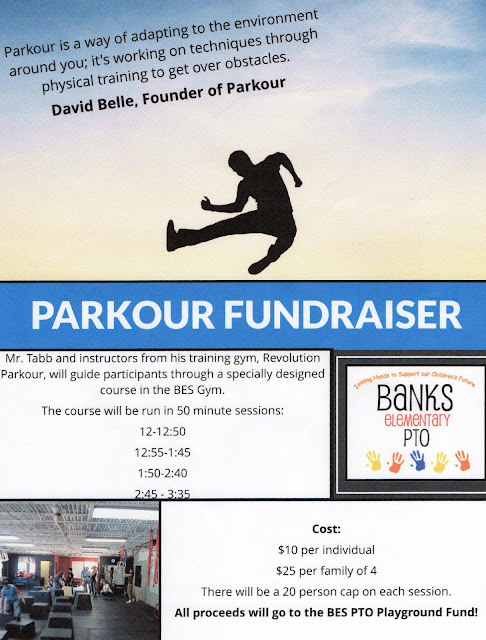 Event runs concurrent with Parkour Fundraiser. 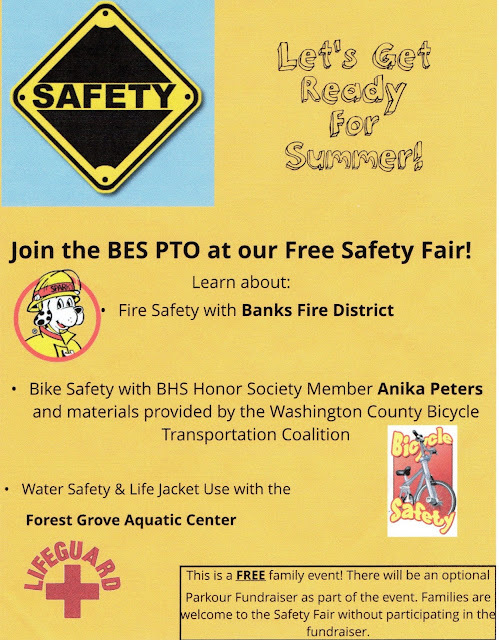 Participation in fundraiser is not required to attend the Safety Fair! All proceeds will support the Playground Fund! Join the BES PTO for a fun filled family day! Silent Auction will feature over 50 items, with a total value of $3000! ü I want Banks Elementary to be one of the best schools in Oregon. ü I want my child to have a great school year – to learn and to have fun! ü I want to help decide how PTO fundraising moneys are spent. ü I want all the students at Banks to be successful. If the above statements are true, then “help us help the school”. Parent involvement is critical for a successful school, so volunteer as a PTO officer or a committee chair for 2017-2018. There are jobs that take no more than a couple hours a month, some are that are seasonal, and a few that require a routine commitment. 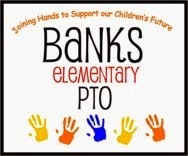 Dedicated teachers, staff, and PARENTS help make Banks Elementary a great school! Join us – it’s rewarding, it’s important, it’s even fun! Nominate yourself or someone else. All positions can be shared. (See back of form for position descriptions.) 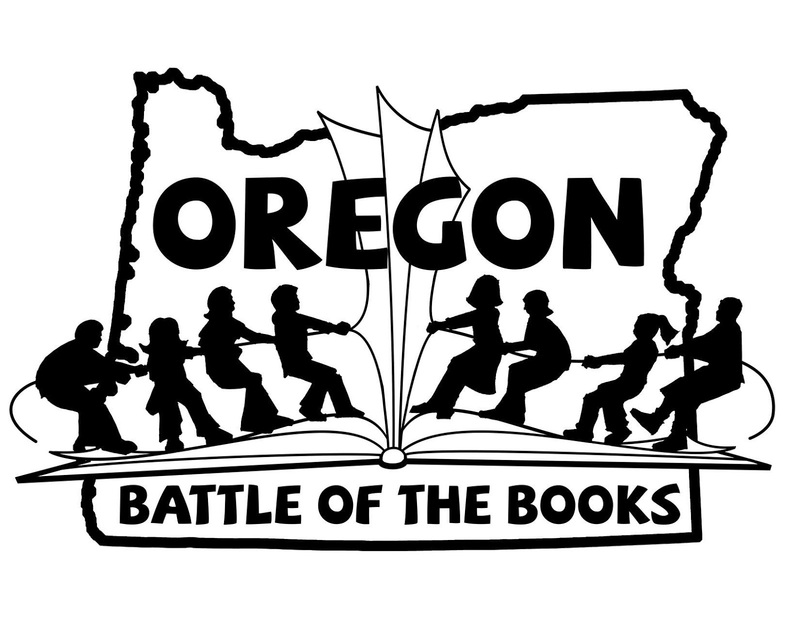 If you have any questions, please contact Heidi at 503-473-9278. Elections will be held at the PTO General Meeting on Wednesday, May 10th at 9:30am in the library classroom. All candidates for officer positions must be registered with the Nominations Committee by May 5th. Please return this form to your child’s teacher or to the school office. Whether you can help for an hour or the whole day, you are greatly appreciated! 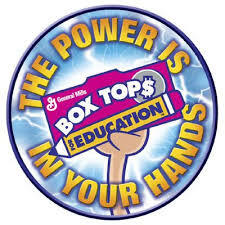 Our next Box Tops For Education Collection is February 21! The counting party will be held on February 23 at the Elementary School. Reminder: Please only send in full sheets! If you do not have enough to fill a sheet, please send them in loose! Always remember to look for expiration dates! Let's help Mrs. McOmie help her students "Fly"! Here is the link to her project: Technology To The Rescue! This year's Directory is in Friday folders just in time for Thanksgiving play-dates, Holiday party invites and Christmas cards! And lastly, a huge thank you to Forest Grove Business Solutions for printing the directory quickly and affordably! Please see them for all your printing needs. 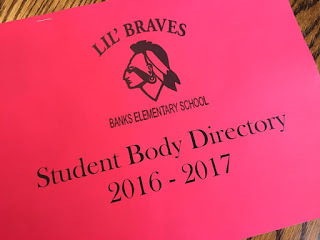 If you need a second directory, please contact the BES PTO. We have a few available for $2 each. Family Movie Night is this Friday! 2016-2017 Student Directory - Entries needed! 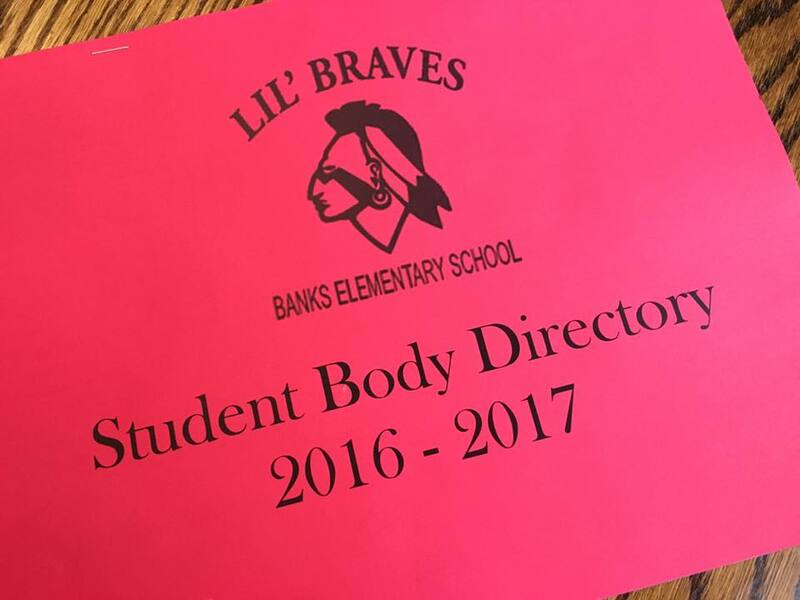 Click on the link below to submit your entries for the new 2016-2017 directory. Please make sure you submit for each child. Did you know that you can be automatically emailed whenever we post something new on our blog? Check out the bottom right corner of this page and enter your email address and click "Submit". It's as easy as that! Hey everyone - just a quick reminder, the Summer Team Read sheets are in the BES front office for pick up. Have a great summer and read a few books! 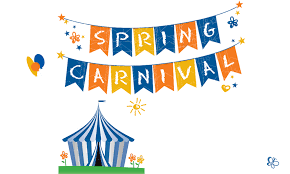 Our Spring Carnival is next Saturday, April 16th 11am - 2pm! For those of you that didn't know, we were granted an unique opportunity to help Bob's Red Mill (BRM) test a new fundraiser platform. Though we promised we wouldn't do any catalog sales, we wanted to take the opportunity to "test drive" BRM and gauge interest. The PTO likes it because it requires minimal volunteer time, returns 40%, is healthy, and doesn't have a lot of "junk" as prizes. Our Alternative Fundraiser was intended to take the place of catalog sales...but honestly, we haven't gotten the response that we needed (we'll keep trying!). With the Alternative Fundraiser, we've had 22 families participate and brought in $1000. Now that the BRM orders have been turned in: here are our tentative numbers - we have had 72 participants. We had $4700 in sales and we get 40% of that, so the PTO will make about $1900. To give you an idea of how that fits in....The 2 fundraisers together brought in about what a catalog sale would bring in. And that only covers about 1/2 of our budget. I know there are a few people out there that we not happy with being asked to sell items, the PTO understands and we encourage you to participate in the fundraisers that you want to support - never feel like you have to participate in everything. We try to offer several different options for people to chose from. Thank you to everyone for your support throughout the year! On Monday, March 7, 2016 the BES PTO will be starting a Bob's Red Mill Granola Fundraiser! This is a great opportunity to support the PTO and provide a quality healthy product for your family! There will be an assembly at 8:25am in the BES Gym, where a representative from Bob's Red Mill will explain the fundraiser and hand out packets! Help us help our students and teachers! As we begin planning for the 2016-17 school year, we would like to know what events or ideas you want to see happen at BES! Join us for a slice of pizza and share your thoughts!! The PTO will provide pizza and soda. Other beverages are available for purchase. Help make our 2016 Spring Carnival a success! Amy Updike and Amy VanderZanden, our co-coordinators, are looking for parents to fill committee positions. Many jobs can be done from home, such as advertising or signing up food concessions, but we also need help on the day of the event, such as manning booths and putting up signs. Thank you in advance for donating your time and effort to this event! Science Fair is coming - Entries are due Fri. Dec 18! Hey Parents - Science Fair is coming! The Fair itself will be held Feb 26 at Banks Middle School. If your student is interested in having a project in the science fair (required for all 4th Grade students), the entry fee and $3 for the display board is due Friday 12/18. Packets will go home this week. The BES PTO would like to announce a change to our Board. Jessica Calmettes has stepped down as President. We wish her well and “Good Luck” in her new full-time job! At the meeting on Wednesday, Heidi Heckenberg (previously our VP) was voted in to take over as President. Congratulations, Heidi! Sue Bair will fulfill the VP roles in the interim until we find a new VP. If you know anyone interested in getting more involved at the school and taking on the VP role, please let us know! Order by December 1st in time for the holidays! We are working on adding additional sizes and colors, stay tuned!! The PTO meeting for this month will be Wednesday, November 4th, at 9:30 a.m. See you there!! Announcing the new BES PTO Alternative Fundraising Form! Didn't like catalog/cookie dough sales? Great! Neither did we! We've come up with this new fundraiser to replace having our kids go door-to-door selling stuff we don't need. Click on the link below to see the details or check it out in this week's Friday folder. P.S. Special Thanks to Rockwall Middle School PTA for coming up with the original idea! Please fill out the directory paperwork and submit it as soon as possible! Thank you!! Here we go! The teachers and kids are back in the classroom, we are all starting to get back into our school year routines, and the first PTO meeting of the school year is just around the corner! The PTO Board is excited to join you in making this a fantastic year for everyone! Join us next Wednesday, September 9th at 9:30am in the BES Library! New BES PTO Board and First Meeting! Welcome to the 2015-2016 BES PTO Board! Our first meeting for the new school year will be Wed, July 8 at 6pm. @ 38159 NW Hahn Rd, Banks, OR 97106. We hope to see you there! We'll be talking calendar of events for the school year, plus budgeting for all that we hope to accomplish! We are taking nominations for the 2015-2016 BES PTO Board. All nominations need to be submitted to the BES office or bankselementarypto@gmail.com by June 1. All nominees need to be able to attend the June 8th PTO meeting (6pm in the BES Library). We'd love to have you! • Create yearly calendar, with board and Principal. night and other events as needed. 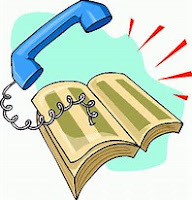 • Present a slate of officers at May or June PTO meeting, lead nominating new officers. • Coordinates child care volunteers & promotes attendance to monthly board meetings. • Serves on PTO committees and assist in coordinating activities of the organization as needed. • Attend monthly board meetings and assist where needed. • Keep an accurate record of all meetings and monthly board meetings, especially noting actions required. • Distribute minutes of meetings within seven days via bulletin board, email, blog, district website and Facebook. • Review minutes of previous month’s meeting at board meeting, following up on actions required. documents in accessible files. Move past records in file cabinet in PTO closet, destroy records over 7 years. • Maintains PTO bulletin board outside office. The Brave Run committee is looking for volunteers the day of the race on Saturday May 16th. Anyone high school age to adult can help. and we have a variety of needs that morning that will help make this a wonderful . It is a great event that supports the Technology Fund at the elementary school. If you are already running, or walking you are helping. If you aren't participating in the race, we would love to have your help! 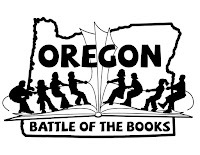 For more information please contact Heidi Heckenberg at heidibears19@gmail.com, or call her at (503) 473-9278. Thank you. We had 4 teachers, 4 parents, and Ms. Waite-Larkin at the meeting this month. We had a great discussion around next year - the PTO working more closely with the Staff on the one fundraiser/event that we have. Getting lots of school support in designing, promoting, and staffing the event in order to help get the community more excited about the event. We are definitely leaning towards a Harvest Fest/Carnival happening on a Sat in fall (tentatively Nov. 9). We agreed to purchase a new dishwasher for the Staff room (the one there is not working and it would cost more to repair than to replace). Ms. Staly is going to research and purchase so that it meets the staff's needs. The PTO gave her a budget of $700. 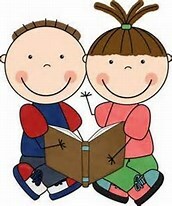 Kinder Round-Up will be May 7, 5:30pm-7:00pm. Art Fair will be May 13, time TBD. Brave Run is Coming Soon! Register now! Race is May 16.
for more details. The race is May 16. Come out and support your school! March's meeting was small - only had 6 attendees. The decision was made to minimize PTO events and fundraising for the next school year. We will be doing JUST 1 event and it will be a fundraiser in 2015-2016. Brave Run would also continue to happen, if the Brave Run committee decides to continue with the event. The hope is that we can get the community, volunteers, teachers, and students to rally around that event, make it HUGE, and earn enough money to support the school throughout the entire year. That means....no cookie dough/catalog sales, no movie nights, no Back-to-School BBQ (the Open house is run by the school, just the BBQ will go away). BoxTop/Labels for Education collection will continue. If a volunteer has a strong desire to have an event/program, and is willing to take a leadership role making it happen, the PTO will be willing to support. The volunteer will need to get PTO Board approval. This would help us stop over-working our volunteers by trying to cover all of the things that the PTO is currently doing, and potentially get more to help with 1 finite event. We will still need to have discussion around what the event will be and how we will financially support the school with the proceeds of this event (1 big project vs. small expenses throughout the year). This decision does not have any impact on non-PTO fundraising activities such as: sports, scouts, library, or school-run events (Run for the Arts, Science Fair, book fairs, etc.). even # months at 6pm, odd # months 9:30 am in the BES library. Add bankselementarypto@gmail.com to your Google calendar and receive automatic updates on your computer and mobile devices.